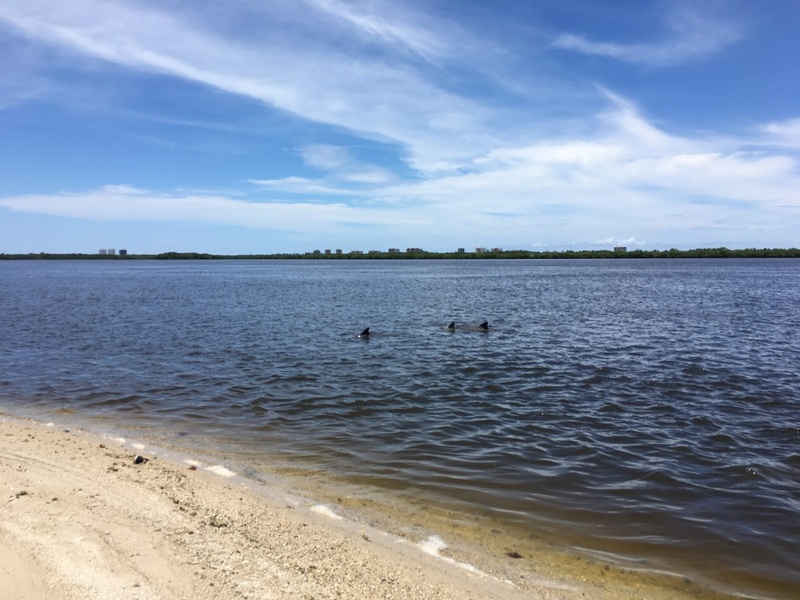 This summer the Chipojo Lab has initiated some new projects at a fascinating new field site in the Indian River Lagoon on the Atlantic coast of Florida. 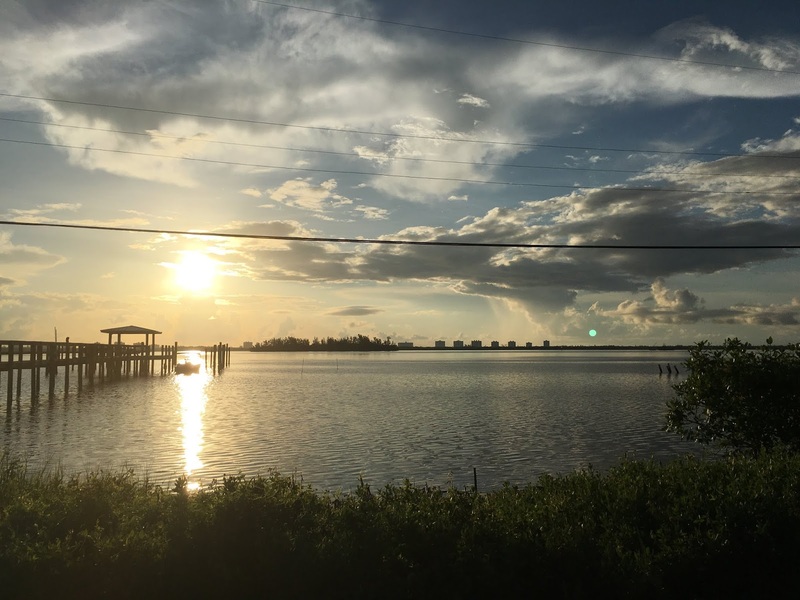 We are working in the Indian River Aquatic Preserve which stretches for 12 miles along the Indian River Lagoon from Vero Beach in the north to Fort Pierce in the south, encompassing over 9500 acres of protected land. Florida’s aquatic preserves aim to maintain the natural beauty of Florida’s coastlines, managed for wildlife habitat, recreation, and cultural heritage. A group of dolphins surface near one of our islands. I am only slightly larger than a newborn 'tee. Along the lagoon are countless spoil islands, which are small, man made islands that result when the debris dredged up to make the channel piles up and breaks the surface. These islands eventually become vegetated and have developed into unique wildlife habitat. Many of the larger islands are home to populations of green and brown anoles, which are the focus of our study. To get to these islands, as you might imagine, we needed a boat. For this purpose, the Chipojo Lab is now the proud new owner of El Lagartijo, a 14 ft aluminum jon boat that we brought with us all the way from Missouri. More about our ship later, though. 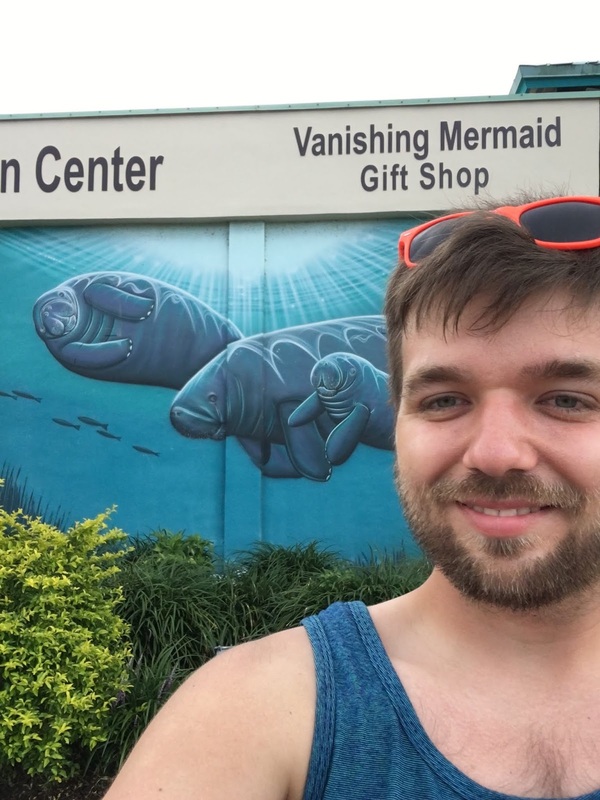 A beautiful mural on the local Manatee Center. 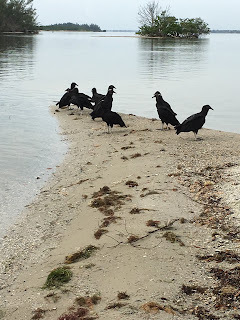 A vulture committee meeting we interrupted one morning. 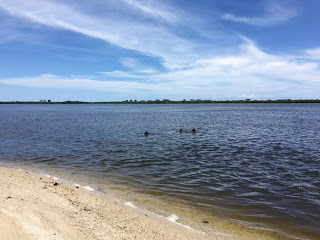 The Indian River Lagoon is the most diverse lagoon ecosystem in the northern hemisphere, containing a huge variety of habitats and species. During our time on the lagoon the last few months, we have been able to glimpse so many magical creatures. 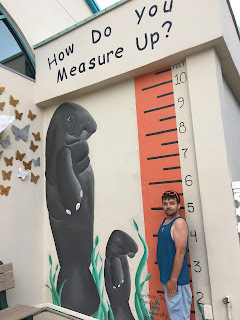 One important habitat are the expansive sea grass meadows, which a large proportion of the world’s West Indian manatee population calls home. 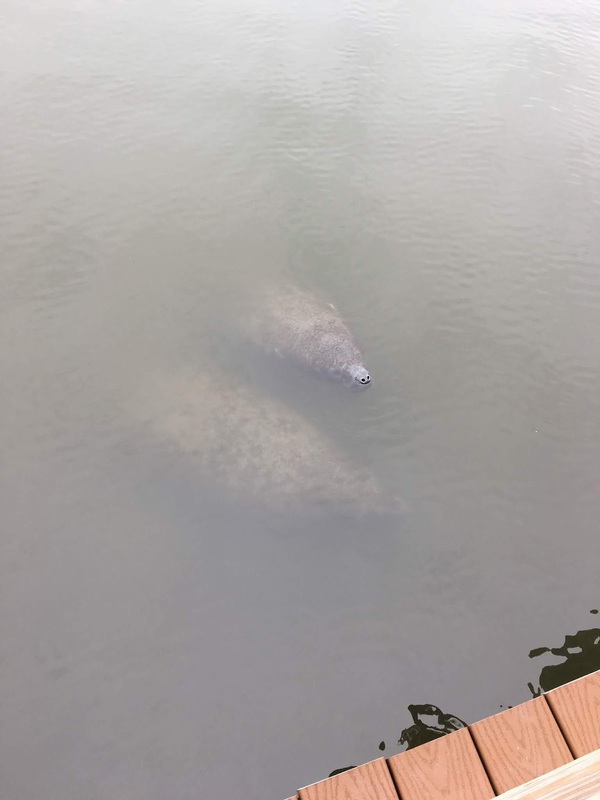 We have seen manatees frolicking at one of our boat launches, Round Island, and just offshore of the islands we work on. Federally endangered wood storks nest in the lagoon, as well as many other migratory bird species. 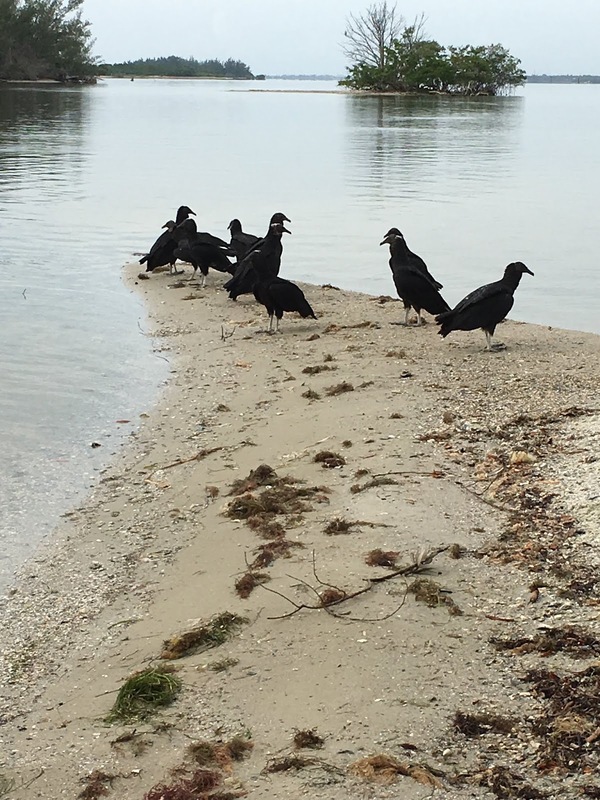 Our group has seen some boisterous nesting herons, committees of black vultures, ospreys carrying fish overhead, cormorants poking their long necks out from under the water, and pelicans diving in to catch their next snack. Dolphins also inhabit the lagoon, and we often see them catching fish and traveling past us in small groups. In addition to the majestic creatures described above, we have also seen some cool tiny critters as well, such as hermit, fiddler, and mangrove crabs, a Florida horse conch, and different sorts of fish jumping from the water. We have yet to see some cool species that call the lagoon home, such as diamondback terrapins and alligators. We are working on it, though! Some manatees surfacing near the dock at Round Island. There is nothing more beautiful than a calm, cool morning on the Indian River Lagoon, and I am so excited to have had this opportunity to work here. The striking view from the dock at the Indian River Waterfront Cottages, where we are staying.